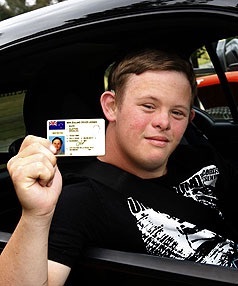 Do you admit handicapped driving students? Thank you. What type of handicap are we talking about? My son James is mentally handicapped, but very high functioning. My wife and I have been teaching him to drive, in Wal-Mart parking lots mostly, and he does surprisingly well. We began his lessons at the age of twelve, but he is getting too big to sit on my lap, so he needs his own license. He knows colors, even though he cannot say their names correctly, so stoplights shouldn’t be a problem. We have recently been trying to teach him to drive a stick shift. By the look on his face, we can tell that he likes it very much, although he is a bit confused by the third pedal. He does get somewhat confused by the rear-view mirror, and believes that it is a video player with small cars driving on it. He sometimes messes with it trying to change the channel to watch his favorite show, HBO’s hit series Game of Thrones.He has a very quick reaction time. I once saw him catch a squirrel with his bare hands. And they are fast. I don’t even think that you or I could do that. We have already purchased him a 2011 souped-up Honda (he likes fast cars), and plan on getting him shiny rims for it. He has a fondness for shiny things. Although he is 46 years old, I think that he will fit in well with the other, younger, students in the class. Thank you. Thank you for the information. We are going to talk to our instructor about this and get you answer on monday! Thanks. James and the family are eager to begin. He won’t stop clapping and repeating “vroom! vroom!” He claps when he’s happy, and you have made him so happy. But I can assure you that it won’t be distracting to the other students. Now he can drive his own damn self to his AA meetings (which, unfortunately, aren’t helping very much). We thank you so very much. Thank you for being so patient. I have talked with a couple of the instructors that we have here. We do not feel that we will be able to give the time that is needed to your student. I do have a phone number for a guy that specializes in teaching students with this kind of handicap. His name is Will Smith and his phone number is 512-293-9262. I’m very sorry I was not able to help you out more. Thanks for your consideration of this matter. We have all decided that James would be better off on a motorcycle, as they are less expensive and he loves watching Eval Knieval stunts. We have explained to him that those are only TV stunts made by a professional, and we think he understands. He also doesn’t like to remove the helmet that we currently make him wear for safety purposes. We will paint lightening bolts on it and it can double as his motorcycle helmet. Thanks again for your help and we will contact Mr. Smith as soon as possible.